CERES Autumn Harvest Festival is on this Saturday (31st March) - see you there! This Saturday, across CERES' ten acre site will be a range of activities and events that celebrate our community, our environment, our sustainable food systems and CERES’s 30th birthday. Take a minute to watch this little video. It makes a good case for sourcing locally grown produce. A little local knowledge from Local Harvest on Vimeo. Follow the journey of a tomato through the industrial food system to the supermarket shelves. Find out why local food alternatives are a good thing, and how easy it can be to find good food close to you. Want to share excess seedlings, swap seeds, talk about what to plant each month and share gardeners' tips? Join us on the second Sunday of every month. We'll provide a propagating table, seed trays and tools, and a light morning tea. Bring your seeds, cuttings and spare seedlings, or just your curiosity. When: 11.00am til 12 noon. All welcome - young and old, experienced gardeners and those just starting out. Open to the whole community. The City of Melbourne, in conjunction with the C40 Cities Climate Leadership Group, invites you into the minds of the world's leading thinkers on sustainability. The sharpest minds on cities and sustainability will be in Melbourne during March for a workshop on sustainable cities and this Melbourne Conversations event is your chance to hear what they are saying. Sustainable communities: collaborating, planning, delivering has been developed in conjunction with the C40 workshop and will allow you to hear about leading-edge approaches to creating and maintaining sustainable communities. Come along and give us your comments and opinions from the audience 'hot seat' or get involved in the conversation online through our Facebook group or on Twitter. All pretty good traits (even if I do say so myself) and a perfect match for volunteering in the garden section at the 'Where the Heart is Festival'. This time last year I was blessed to be a part of the garden department at the 'Where the Heart is Festival'. Essentially the festival is a big pamper day in the park for people who are homeless and doing it tough in Melbourne and a wonderful opportunity for these people to feel connected & part of a community rather then socially isolated & living on the fringe. The festival is an initiative of the 'Royal District Nursing Service (RDNS) Homeless Persons Program'. What's the worst thing that can happen to an environment park that educates kids and grows food? A contamination scare that breaks in the city's most trusted paper. Appearing on page three of The Sunday Age, March 5th edition, just the week before CERES Organic Farm was given the all clear by Moreland Council and the EPA, a feature article reported, "produce grown at CERES banned from sale" because of lead contamination. The timing of Steve Holland's article could not have been worse or more mischievous. When I read the article, including a quote from CERES chairperson, Robert Larocca, which seemed to back up the story, my first thoughts were, "That's not right and why would Robert confirm it?" Monthly guest Adam Grubb from Very Edible Gardens and the Permablitz network chats to Donna and Kulja about lead contamination in Melbourne backyards, issues surrounding food safety, and more on the Grapevine. 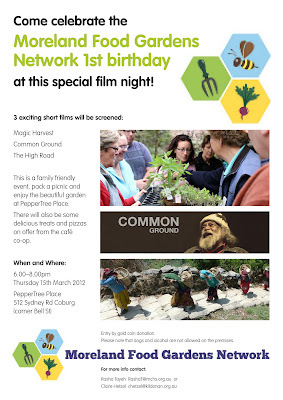 Fresh - The Movie is a new documentary on the industrialised food system. Check out the trailer below for a taste. In particular the intensive urban agriculture set up by former professional basketball player "Growing Power". 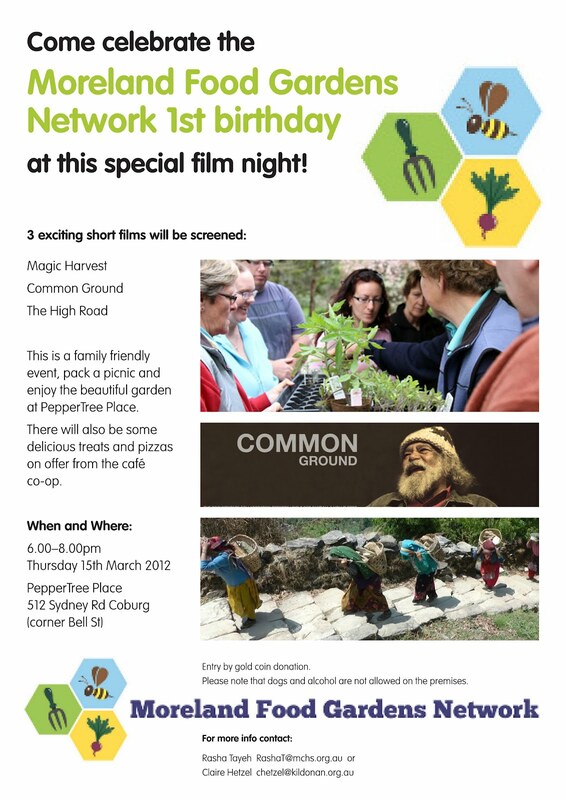 to celebrate our 1st birthday at a very special film night. Where & when: PepperTree Place 6-8pm. Find 15 mins to watch this and see what someone with energy (and this guy has more than enough to go around), commitment and passion can achieve. In this case, growing fresh food for school kids, improving attendance, providing training, creating jobs and more. Stephen Ritz is a South Bronx teacher/administrator. With the help of extended student and community family they have grown over 25,000 pounds of vegetables in the Bronx while generating extraordinary academic performance. His Bronx classroom features the first indoor edible wall in NYC DOE which routinely generates enough produce to feed 450 students healthy meals and trains the youngest nationally certified workforce in America. Stephen has consistently moved attendance from 40% to 93% daily, helped fund/create 2,200 youth jobs, captured the US EPA Award for transforming mindsets and landscapes in NYC, recently won the ABC Above and Beyond Award, helped earn his school the first ever Citywide Award of Excellence from the NYC Strategic Alliance for Health and attributes these results directly to growing vegetables in school. His speech at Columbia University, "From Crack to Cucumbers," along with the release of a You-Tube Video (Urban Farming NYC) resulted in a national following including an invite to the White House Garden. Dedicated to harvesting hope and cultivating minds, Stephen dreams of opening a nationally replicable Career Technical Education public school in the poorest Congressional District in America rooted in urban agriculture, green and sustainable initiatives.